White translucent lotion with the light scent of Grapefruit Oil. This deep-pore foaming cleanser includes the Alpha and Beta Hydroxy Acids of Glycolic, Lactic and Salicylic. These natural acids loosen the bond of dead skin cells to accelerate the natural skin renewal process. Natural Jojoba beads gently exfoliate the skin to prevent occlusion of pores, revealing a fresher and more youthful-looking skin. Great for combination to oily skin types. Apply to face and neck with circular motion. Rinse thoroughly with cool water. 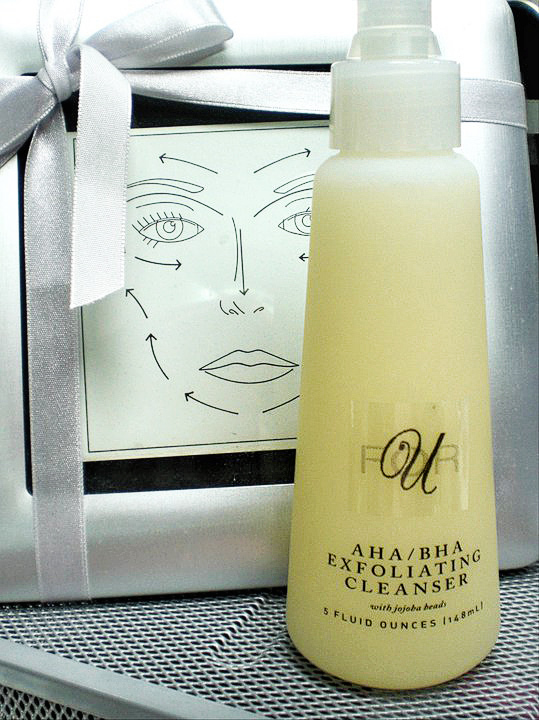 After rinsing thoroughly, follow with a toner and day or night moisturizer or special treatment. Gentle enough to use twice a day. Glycolic Acid -- A naturally-derived Alpha-Hydroxy Acid found in sugar cane. Studies have shown Glycolic Acid is an exfoliant that encourages production of collagen and increases cell turnover. Salicylic Acid -- A naturally-derived Beta-Hydroxy Acid found in Willow Bark Extract. Encourages surface renewal for a smoother texture. Lactic Acid -- Provides excellent moisture, while refreshing skin texture. Jojoba Beads (Hydrogenated Jojoba Oil) -- A natural round bead that will not abrade the delicate skin tissue.